Just in time for the Halloween season, Evil Dead: The Musical made its area premiere at the Falcon Theater this weekend. The show runs at the Newport theater through November 6, 2010. The first indication that this isn’t your typical horror show are the seats covered in plastic. 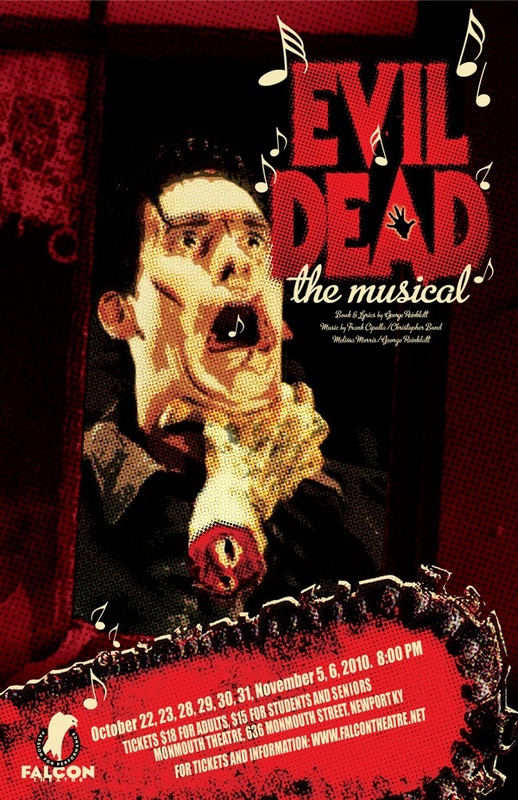 Evil Dead is billed at the world’s first musical with a splatter zone. A section of the theater is reserved for adventurous patrons who don’t mind leaving the theater with bloodstains (all the ‘blood’ washes out easily). Instead of scary and creepy, Evil Dead: The Musical is a hilarious mash-up of comedy, horror, and in-your-face innuendo set to music. Based on Sam Raimi’s cult favorite Evil Dead film series, the musical blends story lines and characters from several of the movies. The action begins with five young people embarking on their spring break adventure to a cabin in the woods. Housewares employee Ash (Nate Moster) leads his girlfriend Linda (Hannah Balash), whiny kid sister Cheryl, randy best friend Scott, and Scott’s ditzy new girlfriend Shelly across the only bridge to the cabin. The group discovers an old manuscript and recording left behind by the cabin’s owner. They listen to the strange recording, inadvertently unleashing an ancient curse. Cheryl (Rebecca Weisman) is the first to fall victim to the strange noises coming from the woods. She’s transformed into an annoying demon that pops up out of the cellar to torment everyone else in the cabin. Eventually everyone falls victim to misfortune – some accidental – as Ash tries to destroy the demon. Fans of the Evil Dead franchise will be excited to see the singing moose make an appearance. As his friends die off, Ash is confronted by the cabin owner’s domineering daughter Annie (Michelle Grove) and her boyfriend Ed (Jeff Surber). Only Annie can decipher and counteract the curse. However, more hilarious misfortunes – and a riotous musical number – befall the remaining non-demons before order is restored. Bryan Franke shone as Jake, the hillbilly who gets caught in the crossfire guiding the couple to the cabin. While all the songs were witty and playful, “All the Men in My Life Keep Getting Killed by Candarian Demons” will stick in your head for day. Sean Mize was great as the lustful and foul-mouthed Scott, while Rebecca Weisman created the perfectly grating demon in Cheryl. While not a perfect, polished performance, the cast was full of energy and passion that left the audience in stitches. Simply put, Evil Dead: The Musical is bloody hilarious fun. Evil Dead: The Musical runs at the Falcon Theater now through November 6, 2010. Tickets can be purchased online or by calling the box office at 513-479-6783 for $18 ($15 students, seniors).